Better late than never. Happy Holidays, everyone! You are my go to girl for inspiration! Such a festive look. You look amazing and I love the skirt. I love the skirt and the sequin top...I love the way you layer too...its kinda different and nicer. an absolutely amazing holiday outfit!! Sparkle and paid - you are a genius. Love your holiday outfit. Wow! You made the holiday colors look so chic and cool! The skirt is amazing! I am pretty much in love with that skirt...do you have a tutorial in store for us? I love it! Khaaaatttttuuu!!! DANG GIRL. You are so gorgeous.. and I'm so in love with this look. I will have to copy that skirt of yours. I actually made a pleated plaid skirt the other week, but I love this inverted pleat version you created... pleats + gathers = greatness!!!! What type of fabric/weight did you use??? I hope you have a fabulous holiday!! Love ya. You made that skirt??! Awesome! I really like the combo of sequins and plaid. That skirt is gorgeous!! I've had my eye on that J Crew shirt, but wasn't sure how it would look on. Now that I see it, it looks fabulous. Definitely going to get it! You made that skirt?! STOP IT. For realz? Wowwww. DYING over this look. You're too cute! I don't know what I love more in this outfit! 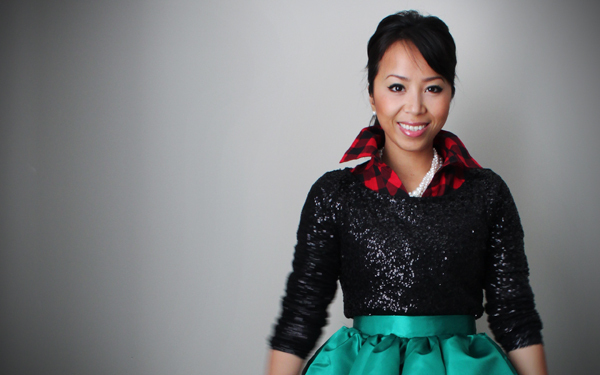 The volume in that skirt is phenomenal.. the sequins are perfect for the holidays.. and the plaid is such a great detail! Amazing styling job. that skirt is fabulous. this is by far my favorite holiday look presented by anyone this year! LOVE this - so festive and adorable. And you DIY'ed that skirt?! That's amazing! I'd love to see a tutorial post from you on how to do that!